Contract or construction managers are responsible for the effective planning, execution and completion of construction or renovation projects of all types of structures. These include homes, office buildings, residential homes, bridges and hotels. They prepare and negotiate cost estimates, budgets, and also collaborate with architects, engineers, and other construction and building specialists. There are quite a number of schools that offer degree programs in contract management that would help students learn about building codes and standards, materials and contract administration. Graduates may also pursue a career as contract administrator, cost estimator or purchasing manager. The Bureau of Labor Statistics reports that jobs for construction managers are expected to increase by 16% between 2012 and 2022. Contract management programs are offered at both undergraduate as well as graduate levels. Students may work towards a degree offered at traditional campus based schools or pursue an online program. 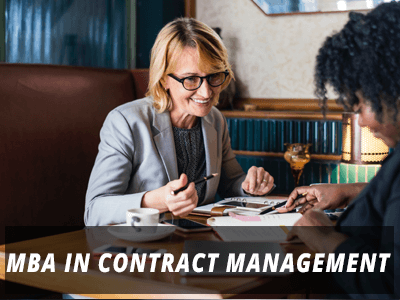 The bachelor's degree provides students with the basics of contract management while the graduate programs help students have an in-depth knowledge in this concentration. The bachelor's degree generally takes 3-4 years to complete while the master's degree can be earned in 1-2 years. The program duration is subject to the enrolment status of students. Candidates may focus their degree in engineering, construction science or construction management and find out how to apply innovative solutions within complex environments. The curriculum may also include topics such as cost estimation, building codes and standards, construction methods and materials as well as contract administration. The MBA in contract management combines business principles with construction management principles. The coursework may cover advanced courses such as advanced contract negotiations, intellectual property in business, advanced procurement procedures, and human resources management. The program may require 1-2 years for completion depending on the enrollment status of students. Students who want to pursue a degree in construction management but cannot attend regular programs may consider the online route. The distance learning programs can particularly be suitable for working professionals and stay-at-home parents who cannot make it to traditional degree programs due to busy schedules. Classes in these programs are conducted online and students do not have to study at fixed timings. Instead, they can study anytime that suits their individual routine and complete a program at their own pace which is not the case with programs offered at traditional schools. To pursue a degree in contract management, candidates need to at least have a high school diploma or GED. Some programs may require students to have related work experience. In addition, candidates may have to provide letters of recommendation and appear for an interview as well. Contract managers may work independently or find opportunities with building services, building and construction management, general management, engineering firms, or contract administration. Compensation depends on experience, location and qualification among other factors. As of 2012, the median annual wage of construction managers was $82,790. In addition to basic compensation, they may also get overtime pay and bonuses. Q:What are the contents of the course on Business Law in the Contract Management MBA degrees? A:It is common to get to read about the course on Business Law while going through the Contract Management MBA Degrees program. This course is worth 3 credits in total. it is designed to offer students with substantial understanding of the basic level principles of business law that are used in various contracts and insurance plans. Q:If i am already on a job and still want to improve my earning potential, what kind of MBA in Contract Management will be feasible for me? A:There are two kinds of MBA in Contract Management degree's available. Certification Program and Short Diploma. While Certification Program is specifically for undergraduates. The Short Diploma is best suited for working professionals. Classes for this are usually conducted over the weekend for the convenience of the attendees and in the form of workshops or seminars. normally it takes about two months to complete this diploma program. Q:May I study for the contract management MBA online? A:This MBA is available to be taught, both online and in a traditional classroom-based environment. The online program will provide you with a similar academic understanding as those students who are taught in the classroom. The online program can be studied at your convenience from your home/ workplace and therefore is extremely popular. Q:What is a MBA contract management degree? A:An MBA in contract management is basically a graduate program that aims at equipping students with fundamental knowledge about business law and contract law. The program is completed in two years in which students learn how to resolve and manage corporate contracts and deals. The program can be studied online via distant learning schools.